Drogmi Buddhist Institute belongs to the Sakya school, one of the four main traditions of Tibetan Buddhism. The Sakya lineage is headed by His Holiness the 42nd Sakya Trizin, a great spiritual master and direct descendant of the Khon lineage, a very ancient Tibetan family. He is second only to His Holiness the Dalai Lama in Tibetan Buddhist protocol. According to legend, the Khon family had celestial origins. The original Khon were, for about 13 generations, Nyingmapa practitioners, but during Khon Konchok Gyalpo's time, they felt the time had come to establish a separate school, so the Sakya order was founded in 1073. The most important feature of the Sakyapa tradition is that the original source of its main teachings is the Indian mahasidda Virupa, who established the Lam Dre teaching, which is an Hevajra practice. ​The tradition also has extensive teachings that come down from Nagarjuna, while the Thirteen Golden Dharmas come down from Naropa. 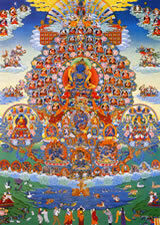 The other schools of Tibetan Buddhism regard the Sakyas as the guardians of many key teachings. His Holiness points out that, unlike the other Tibetan schools, the Sakya lineage is hereditary rather than based on reincarnation. The Sakya teachings are held to be especially strong and powerful because the family holds the Emanation of Manjushri within itself.